The challenge of determining whether an individual is an employee or an independent contractor under the National Labor Relations Act (NLRA) continues, but the National Labor Relations Board (NLRB) issued a 3-1 decision January 25 that can help. In the case, SuperShuttle DFW, Inc., the agency overruled its 2014 decision in FedEx Home Delivery and reverted to its longstanding common-law test for making this determination. The case began when a local union wanted to represent a unit of SuperShuttle DFW drivers. SuperShuttle DFW, however, argued that, since the drivers were not employees under the NLRA, they could not organize. The NLRB found that airport shuttle-driver franchisees were independent contractors because the drivers had considerable entrepreneurial opportunity which, this latest decision indicated, is the primary determinant of independent contractor status under the NLRA. The NLRB held that the FedEx Home Delivery decision "impermissibly altered the Board’s traditional common-law test for independent contractors by severely limiting the significance of entrepreneurial opportunity to the analysis." Factors that contributed to the decision include that the SuperShuttle franchisees owned or leased their vans; they exercised nearly complete control over their daily work, schedule, and method of payment; they work under minimal supervision; and they keep all their earned fares except their franchise fees. These factors point more to entrepreneurial opportunity and control rather than employer control. Some factors pointed to an employer-employee relationship, but they were insignificant compared with the independent contractor factors. They included that the job required relative skill and the extent of SuperShuttle’s involvement in the business. Therefore, employers with workers who have more of an entrepreneurial opportunity for financial gain may have more leeway in characterizing them as independent contractors. Such employers may more easily avoid unionizing efforts and charges of unfair labor practices. Of course, many influences must be considered based on the specific facts involved. 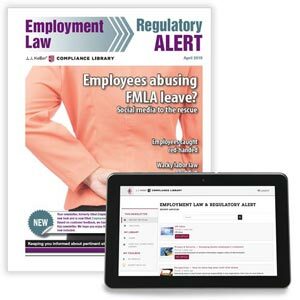 J. J. Keller's Employment Law Today newsletter explains why you need to care, what you need to do and how your business could be affected by HR industry news.